With only a week left before Hillsborough Area Regional Transit launches its Mission MAX system restructuring, I wanted to take a few moments to provide a personal reflection on the West Tampa Transfer Center. HART will be closing down the center permanently after Saturday, October 7, 2017 in favor of having an on-street transfer along Dale Mabry Hwy at Tampa Bay Blvd. The former bus bay on the former Tampa Bay Center property in 2006. Credit: HARTride 2012 (Public Domain). While the current West Tampa Transfer Center will barely be 10 years old when it shuts down for good, the general transfer point has been around for much longer – perhaps even before the inception of HART in the early 1980s. During the 1980s, Tampa Bay Center was one of Tampa Bay’s premier shopping destinations. The mall opened in 1976 and was anchored by Sears, Burdines (which was later absorbed by Macy’s), and Wards (which opened in 1979 and was originally known as Montgomery Ward). During the early and mid 90s, my family took me to Tampa Bay Center on a regular basis and I was constantly wowed by the bright, open atrium, eloquent fountains, and the glass elevator by the food court. Interior of the Tampa Bay Center mall and its vast atrium prior to the grand opening. Click on the image to view the source website. 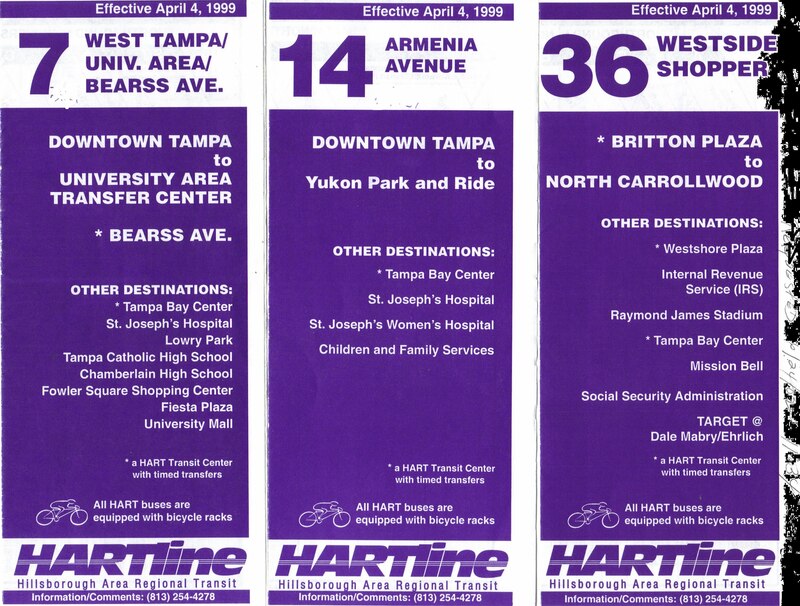 Like many transit systems across the nation, many of HART’s early transfer points were situated at shopping malls, and Tampa Bay Center was no exception. Several canopies were set up near the Wards entrance to the mall and Routes 7, 11, 14, 15, 32, 36, 41, 44, & 45 all traversed the spot at one point or another. The original Route 11 was axed during the 2005 system restructuring, and Routes 14 & 15 were removed from the transfer hub. Route 44 was merged into Route 45 in 2007. Route 11 will make a return in 2019, but will not serve this section of West Tampa – instead serving the Main St corridor and International Plaza. Brochures for Routes 7, 14, & 36. Scan by Orion 2003. 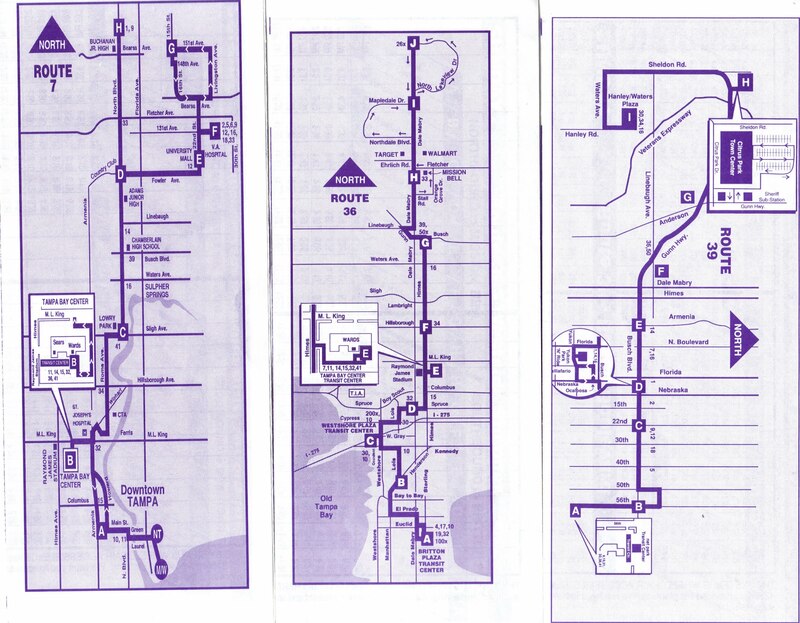 Maps of Routes 7, 36, & 39 as they were during the late 90s/early 2000s. Scan by Orion 2003. 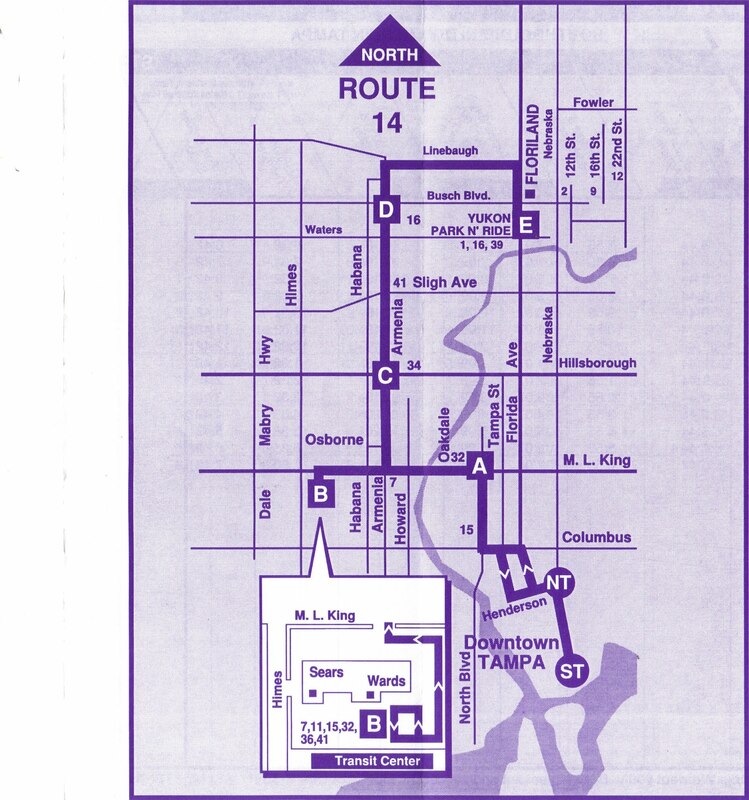 Route 14 still follows this route, but the Tampa Bay Center leg was eliminated sometime in the early 2000s, likely to improve efficiency. I’m sure the downfall of the mall also contributed to the decline in public transit in that area. Scan by Orion 2003. As parts of the Tampa Bay region boomed, shopping preferences changed. Various demographic shifts and retail cycles, along with some misfortune during the 90s, ultimately led to the closure of Tampa Bay Center. By 2001, most shoppers and retailers were drawn to either the WestShore Business District, Brandon, or Citrus Park. Wards had gone out of business entirely – along with many other chains that have demised over the decades. Sears was the final tenant to leave Tampa Bay Center, moving over to the former Dillards spot at WestShore Plaza. Dillards vacated WestShore Plaza to join the then-new International Plaza in 2001. The land that Tampa Bay Center sat on was then sold to the Tampa Bay Buccaneers for their new facility, and demolition of the mall commenced shortly thereafter. The HART transfer center canopies and large sections of the parking lot were the only relics left of the former mall. The West Tampa Transfer Center looking east from Himes Ave.
With Tampa Bay Center gone for good, HART was left to ponder where to relocate its West Tampa bus hub. Many options were explored and likely included parcels in West Tampa, Drew Park, and even near WestShore. However, a parcel on the northeast corner of Himes Ave and Ohio Ave was eventually chosen for the new hub. The facility would include five sheltered areas for seamless transferring, plus a street-side stop on northbound Himes Ave for the northbound Route 36 buses, restrooms for both customers and employees, and vending machines. A ticket vending machine was added in 2013 to allow customers to purchase passes without having to make the trip to downtown. It was originally envisioned that the West Tampa Transfer Center would become a launchpad for expanded operations towards WestShore and Temple Terrace. Two additional bus bays were constructed just north of the central building to stage buses. The northernmost bay was constructed to eventually accommodate a 60-foot articulated transit bus should the East-West MetroRapid Bus Rapid Transit line be built. Longer-term plans discussed the possibility of adding a light rail corridor along Himes and Dale Mabry. One of the additional bus bays at the WTTC – designed to handle an articulated transit bus. The WTTC would have been served by MetroRapid East-West. The future of the line itself is uncertain due to funding constraints. One of the good things about the old Tampa Bay Center Mall was that it was right across the street from the old Tampa Stadium (later called Houlihan’s Stadium). What is now Raymond James Stadium replaced Tampa Stadium during the late 90s. While having the WTTC next to the old mall property was good for customers in the sense that they didn’t have to go too far from the old stop to access the new one, the major sore spot was that stadium events forced the hub to shut down due to traffic and security concerns. Buses would have to stage along St. Isabel St by MacDill Ave during stadium events. This procedure inconvenienced many customers who didn’t want to walk extra blocks to get to their bus. The temporary staging area on St. Isabel St, behind St. Joseph’s Women’s Hospital. I’m sure not a lot of people liked seeing this banner during stadium events. The route 36 Southbound stop. While an immediate closure of the WTTC wasn’t on my mind prior to the announcement of Mission MAX, I knew that there was a good chance that the WTTC would not survive beyond 15 years due alone to the fact that it kept having to close during stadium events. I always thought that it would make more sense to have a transfer point along Dale Mabry because the highway rarely ever shuts down completely unless there is a major traffic incident or if the event at Ray Jay is significant enough to warrant a complete closure of the highway. Himes, on the other hand, is always closed during stadium events. Another reason why I believed that the WTTC would not last much longer is the fact that transit agencies are gradually moving away from having fixed hubs and are transitioning to a more grid-based system where transfers are done at major intersections. HART made a major shift towards a grid system in 2005 and Mission MAX aims to get the system another step closer to a true grid. I fully realize that HART management back in the early 2000s was different and perhaps leadership back then had a different view of the system than current leadership does. I just never agreed that the current spot for the WTTC was the best place for a long-term transfer hub and believe that the funds to relocate the hub could have been better spent on a more robust location that would have provided a sound footing for expansion down the road. While we cannot change the past, we can look forward to the future – and that is what HART is aiming to do with Mission MAX. While many of the changes that will become effective on October 8, 2017 were contentious amongst many riders, I can say that the decision to close the WTTC for good was a good decision.